Service management always entails the process of delivering quality services in a way that meets business needs. Healthcare IT is no exception though IT professionals who work in hospitals will tell you that quality service delivery takes on an entirely new meaning and can be the difference between life and death when direct patient care is involved. The service desk in healthcare facilities must get the answer both quickly and correctly whenever the outcome plays a role in patient care. Healthcare IT teams deal with a host of issues ranging from routine administrative issues to those that impact patients directly. IT customers can be physicians, emergency personnel, office staff and at times patients themselves. These dynamics substantially influence service support activities. 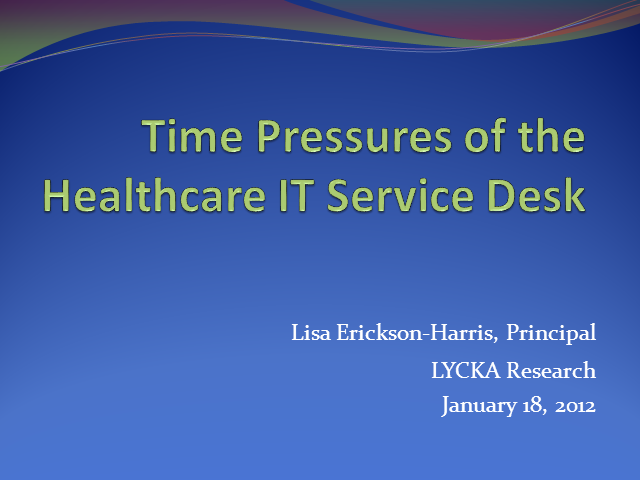 Time really can matter to personnel that cannot move ahead with patient care until an IT issue is resolved. Effectively prioritizing service desk issues is the key. This presentation will highlight the dynamics of this fluid environment through the use of case examples. Participants will leave with an understanding of how quality and response metrics should be directly linked to the service delivered in a healthcare environment.